I sailed today but in very different conditions to those in this picture (taken last week). Today the winds were about 30 knots gusting to over 50 at times and the waves were about 6-9 feet, which made for an exciting ride running from Hamilton to Burlington Canal. 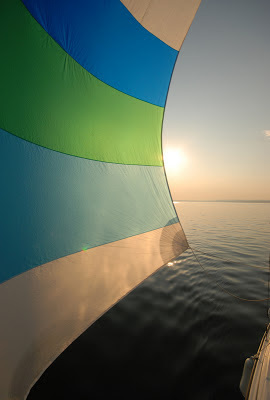 But because of the gusts I used just a headsail and did not want to chance the main. This meant that the boat would not point well heading back—for a while I tried tacking but we were not making ground so I took in the sail and motored back. What I would give for a furling main or even jiffy reefing so that with a balanced rig I could have tacked into that weather wand those waves—now that would have been an exhilarating ride! Even so, the motor back was brilliant with the boat plowing through the waves in spectacular bursts of sparkling spray! I got quite wet and it was icy cold, but it was not long before we were back and I was sitting with the crew in front of a fire at Williams sipping hot chocolate. Another perfect end to another perfect sailing day! PS: I did not get pictures of today’s sail, but my cousin did, maybe when he sends me some I will post them.